As soon as Christmas was transformed from a feast day—with festivities more akin to the carousing that now happens on New Year’s Eve—into a cozy domestic holiday geared toward children, adults became concerned that the focus on gift-giving would spoil children. Stephen Nissenbaum, the author of The Battle for Christmas: A Social and Cultural History of Our Most Cherished Holiday, notes that the publisher Horace Greeley took to the pages of the New-York Tribune (the paper he founded) in the 1840s, right around the time that Americans were reading A Christmas Carol, to admonish readers about consumerism defiling Christmas. The historically thrifty culture of the U.S. was being steered toward a new kind of consumerism, and direct connections between the figure of Santa Claus and a patriotic duty to shop during economic lean times were being made in print ads regularly by the middle of the 19th century. Promoted as a wholesome, preindustrial figure who makes toys by hand, Santa was the ideal figure to divert attention away from mass production; in some ways, he helped comfort a public uneasy about industrialization. This kind of anti-commercial critique was all over the place during the economic boom time of the 1950s and ’60s—when “Green Christmas” came out. In Dr. Seuss’s 1957 How the Grinch Stole Christmas, the Whos of Whoville proved that the Grinch couldn’t steal their Christmas spirit, because it’s not a commodity that can be given or taken away. 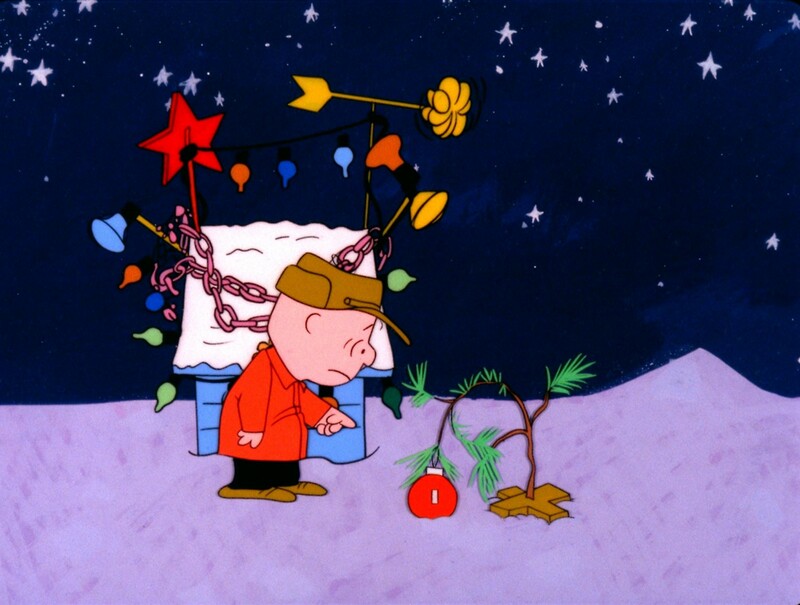 And in A Charlie Brown Christmas, which premiered in 1965, Charlie and Linus turned their backs on Lucy’s gaudy forest of pink aluminum Christmas trees, and celebrated the message of “peace and goodwill towards men” with a forlorn, nearly bare pine tree that sagged under the weight of a single ornament. This idea—that we need only one another, standing firm inside the eye of a powerful retail hurricane—is presented anew in some form each December, revealing something about a given era’s particular relationship with consumerism. “Green Christmas” would have been a kind of thinking person’s Christmas classic had it been widely shared when it first debuted. Perhaps because Charlie Brown and the Grinch delivered their versions of the “Green Christmas” message in a softer voice—aimed (like the holiday itself) at children, and without taking such direct aim at business and advertising—adults were more receptive to it. After all, kids are usually not the ones making purchasing decisions, which leaves grown-ups to wrestle with the question of whether to indulge in a festive retail splurge or to adopt a more austere, buy-nothing ethos and suffer the consequences on Christmas morning. No store would dare play anything as gauche as “Deck the Halls With Advertising,” but Freberg’s holiday masterpiece is a timely reminder this season, not necessarily to abstain from shopping altogether, but maybe to at least think before we buy.